CEO of Celestino Mr John Vassallo says the Upper Ross is the most strategically located, large tract of undeveloped land in Townsville, with quick and direct access to major employment centres such as Lavarack Barracks, the University, and the Stuart and Bohle Industrial Areas. Mr Vassallo said the motorway and the ring road provided the strong connectivity for the Upper Ross to the rest of the city, and new announcements had only cemented the area’s potential with the $30M upgrade to Riverway Drive, the Council’s approval of the Wingate Development, and projects such as a $250M solar farm at Kelso. “Although at a different scale, the similarities between the Upper Ross and Western Sydney are striking,” Mr Vassallo said. “Being born and bred in Western Sydney I saw that for a long time the area was unfairly derided as backward and rural, but the suburbs west of Parramatta such as Penrith, Camden, Liverpool and the Hills District are now the engines of growth for greater Sydney." “We invested in the Upper Ross in 2009 with the Pinnacles project because we saw the same development potential – a strategic location, a large youthful population and a passionate local community which aspires to build a better life for their families. 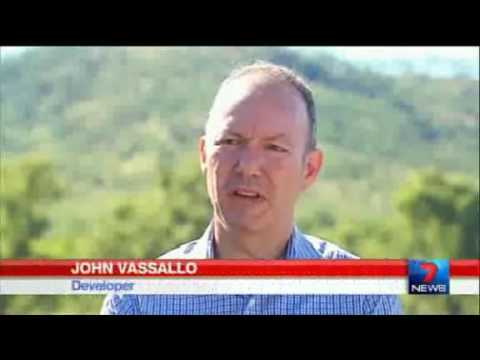 Pinnacles can be the North Shore of Townsville’s South West and will anchor and spur a whole range of new development that will boost local and regional job creation and grow local business." Mr Vassallo said the Pinnacles project was before the Planning and Environment Court with a range of expert reports being presented to establish the project need. He said he was hopeful that Council would approve the project on its merits and that construction could commence on the 5,000 lot mixed use masterplanned development within the next 3-5 years, with a 25-30 project lifespan. “I understand that the Mayor has described our project as a worthy development, but we understand her desire to ensure that ratepayers are not impacted by the cost of infrastructure,” Mr Vassallo said. Mr Vassallo said one of the most exciting elements for the Pinnacles project and Townsville more broadly was the opportunity to link the project into its massive Sydney Science Park development. He said Celestino was committed to the development of Pinnacles as a sister project with Sydney Science Park, which will be built over 287 hectares at Luddenham, close to the planned new Western Sydney Airport at Badgerys Creek. “We have received unanimous approval for the $5B Sydney Science Park from Penrith City Council, which is an Australian first mixed use research and development centre of excellence in the key growth areas of food and agribusiness, energy and health. Our vision for Sydney Science Park is to achieve an internationally recognised research and development epicentre that will employ over 12,000 professionals, educate 10,000 students, and provide 3,400 quality residences to cater for these groups in a mixed use town centre environment. Already we have established a partnership with the Catholic Education Diocese of Parramatta to build the first purpose-built STEM (Science Technology Engineering Maths) school in Australia on the site and the CSIRO will be establishing a research and development innovation zone, the second of its type in Australia. Mr Vassallo said the national and international linkages established in the development of Sydney Science Park could be leveraged for Townsville’s benefit. “People said we were mad to consider a national centre of science excellence in Western Sydney,” Mr Vassallo said. The $1 Billion Pinnacles project at the Upper Ross proposes 5,000 residential dwellings, an enterprise employment zone, mixed use town centre, sporting fields, and over 400ha of environmental corridors and open space.